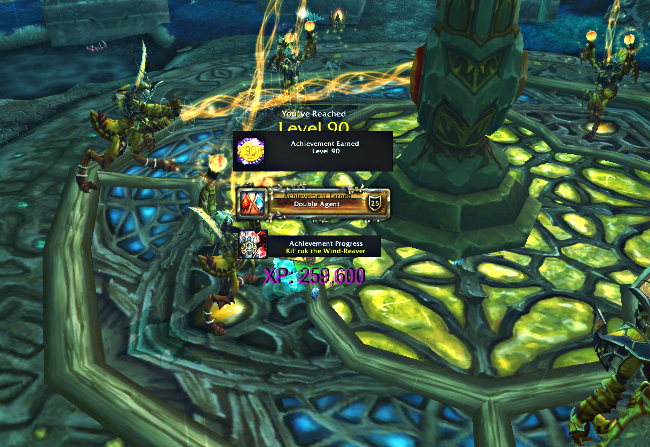 Garrosh is down at last, hurray! Not a guild kill though – I just got really lucky with joining a solid almost-guild group after spending hours upon hours watching trade chat. 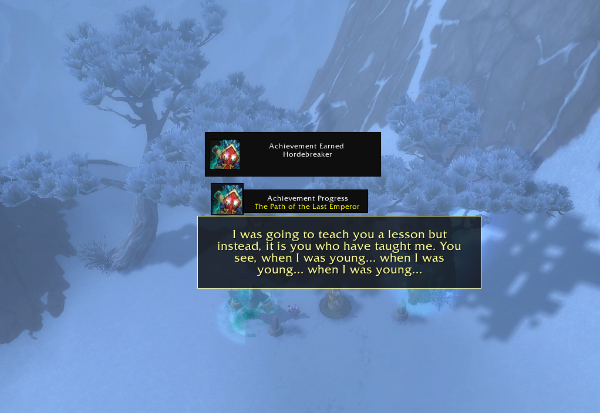 And to think, they were starting all the way from Dark Shamans so I very nearly didn’t ask to join! Boy am I glaaaaaaad I did. We were even hit with Battlenet going crazy right before we pulled Siegecrafter – practically everyone aside from me and a rogue got disconnected and couldn’t log back in. I thought that was it, and they actually did sort of call it, but then one managed to get back online and suddenly we were good to go again. Phew! The strat they use is clever, too – one tank, two healers, with melee heading right and range going left for the intermission phases. DPS is crazy when you have 7 of them! We even lost one melee early on in Phase 2 and still blew through. Obviously the tank and healers were really epic at what they do, too. 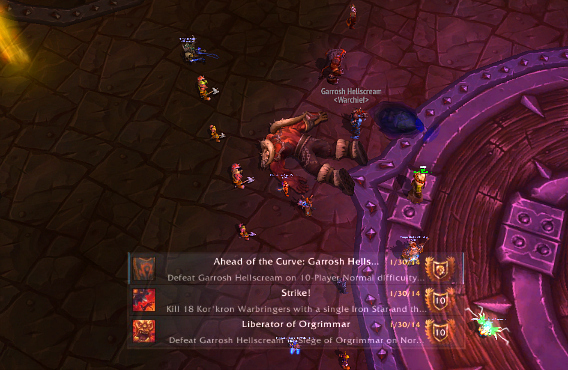 Well, Sunday was our last shot at getting Garrosh down with the team and we didn’t make it. I won’t lie about being really disappointed – it just feels like we kept getting stuck in a cycle of making really silly mistakes. 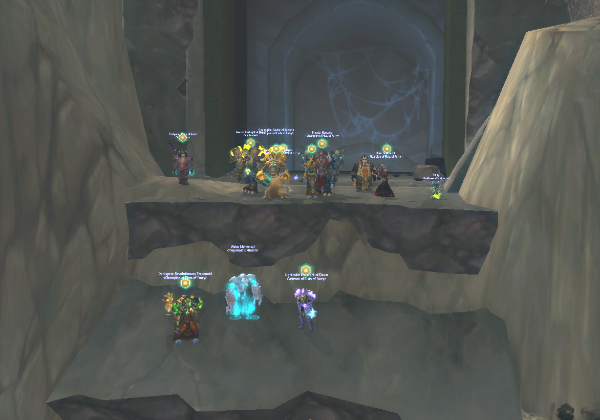 Dying to Iron Star, dying to Desecrate, people tunneling and ignoring Mind Controls, people standing in Annihilate… overall we did manage to improve on controlling the adds spawned during Empowered Whirling Corruption, but we wasted more time wiping to mess ups than anything else. Our best attempt ever was seeing him hit Phase 3, but by then everyone but the Mind Controlled folks were dead. There’s been mention of merging with a friend’s raid group – they’ve also lost a whole bunch of people, so it makes sense. But they’re a bit behind progression and gear-wise, so the plan is to start fresh all over and get to know each other as a team. Hopefully it works out! 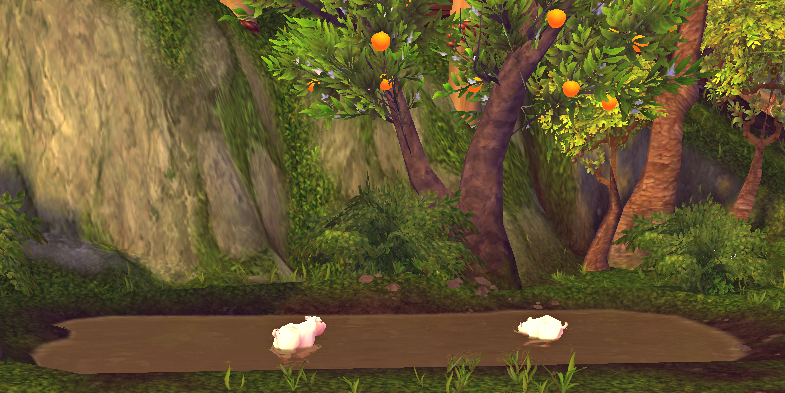 Recruitment is hard this late in the expansion. 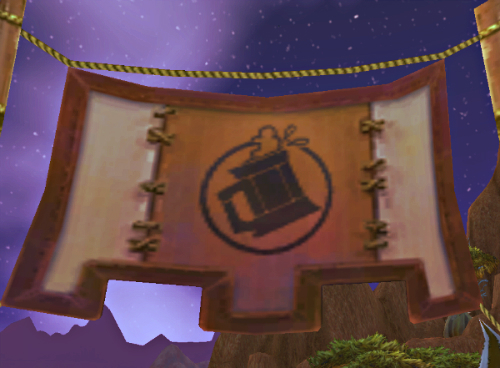 See you in a month or so, Garrosh… I hope. 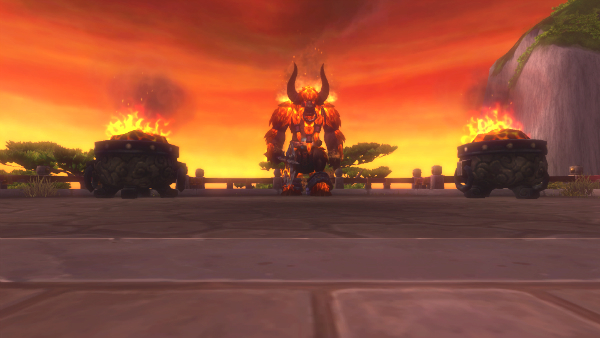 Garrosh is having the time of his life kicking our sorry butts, I’ll bet! Saturday’s raid went fairly well – we had a bit of a issue with a mouthy mage pug at first but that sorted itself out soon enough. 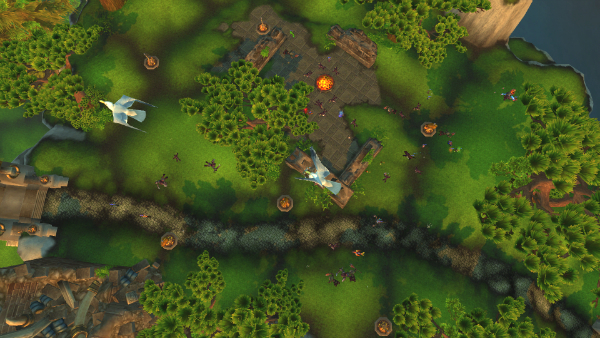 After that and the usual warm-up attempts we actually started getting to Phase 2 consistently with all the adds dead before getting ported into the other realm. No more spiky tank damage, and DPS and heals were doing pretty good too; three healers but our monk Fistweaved most of the time. Everyone was really on top of the Mind Controls, which was awesome! We were stuck on Phase 2 though, and kept wiping to the adds after Empowered Whirling Corruption, but at least some progress was made! Sunday’s raid… didn’t go as well, sadly. We wiped right away on trash – always a bad sign – and then had some silly mistakes with Desecrate puddle placement, Annihilate deaths, Iron Star deaths even! Monk had a family occasion to attend so we tried 2-healing – I thought it worked quite well but MCs kept targeting both healers at the same time which caused more problems. 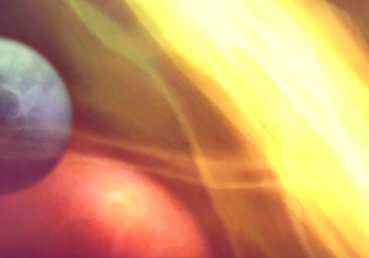 3-healing was safer but the flip side is Garrosh gained a lot more energy in the other realm. And the Empowered Whirling adds turned out to be a massive road block. For some reason we’re really bad at controlling and killing them away from each other. 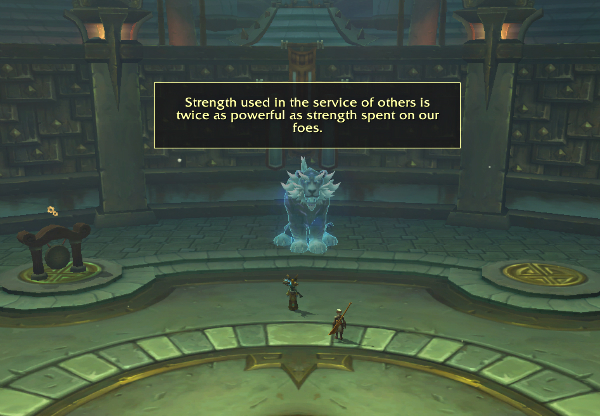 We continuously have at least 3 Empowered adds running around within seconds of spawning, which is horrible. Pallytank’s self-healing and general crazy aggro pulls most of the adds onto him, and someone ends up killing those instead of the few we have isolated. Our DK offtank tries to pull them away from Pallytank and kite them away and someone kills the ones on her instead! Big biiiig sigh. It feels like a really silly place to be stuck at for so long. Hopefully after this reset we’ll be better at it. 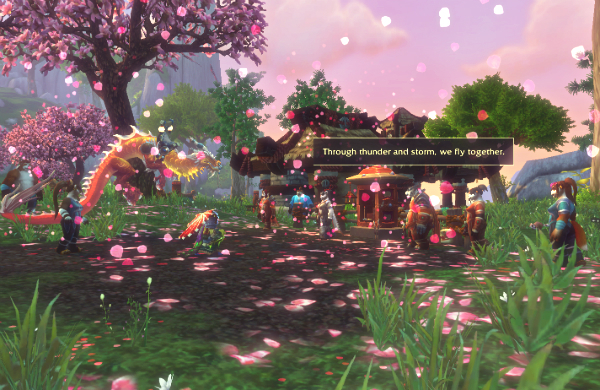 One week left – two raid days before February arrives! Apologies on the (unfortunately, usual) tardiness! 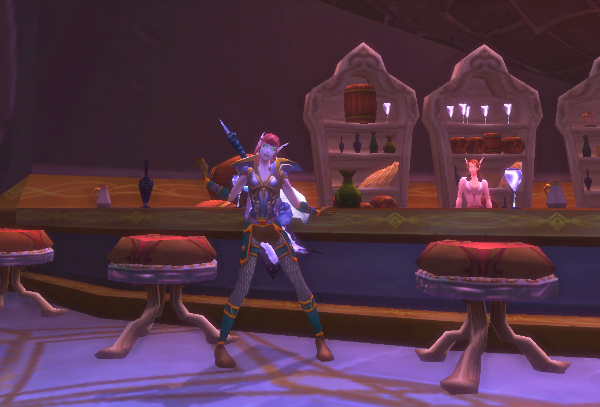 It seems as though my crazy bit of leveling-nonstop-to-get-hordebreaker effort ended up with an unintended and painful side effect: my right hand has decided to go on strike and twinge sharply in protest every time I try to do anything with it. Like hold a fork. Or a mouse. So! I’ve gone on a bit of a break the last several days in an attempt to appease it; the pain has diminished sufficiently that I can play again, provided I take breaks regularly. Lesson to learn here, kids: they aren’t kidding when they say nonstop gaming is bad for you. But generally people already know that. Getting read = stories. 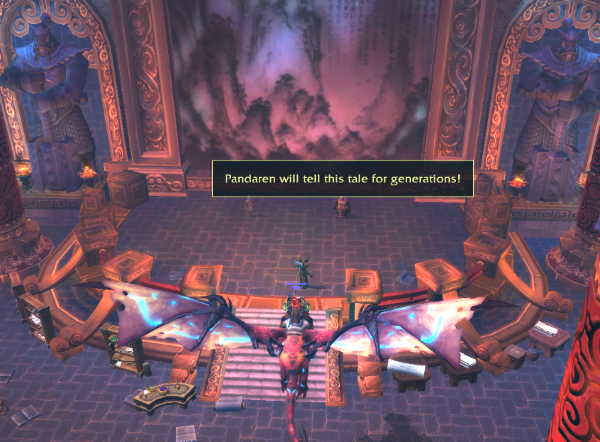 Stories = Lorewalker Cho, always. 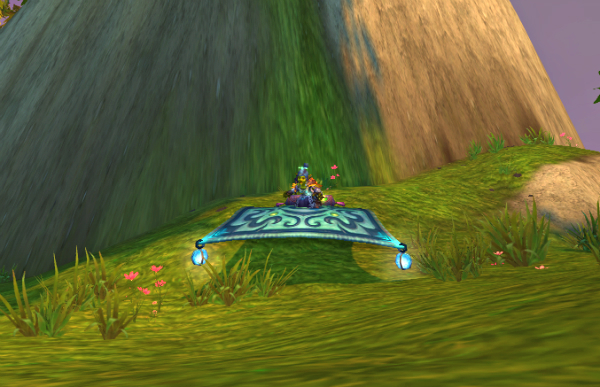 Favourite mount made by my tailor – frosty flying carpet! 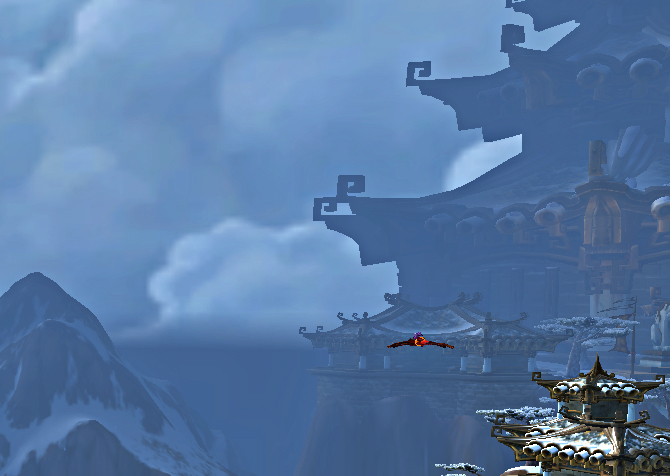 Joined the rest of the world in exploring the Timeless Isle! We’re waiting to kill the Pirate Ship here. We’re also causing massive lag. 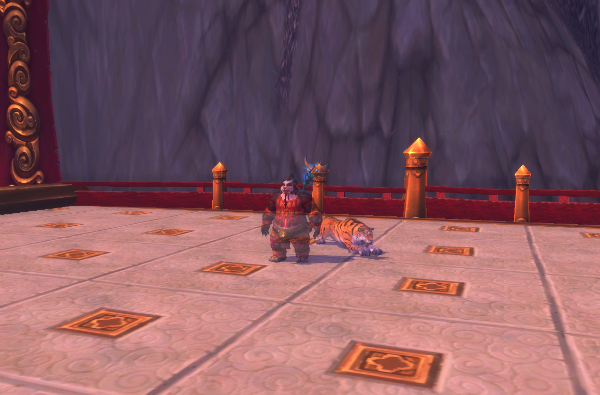 Xerna, Wrathion, even the gong have shadows… but the Celestials don’t. Weird? 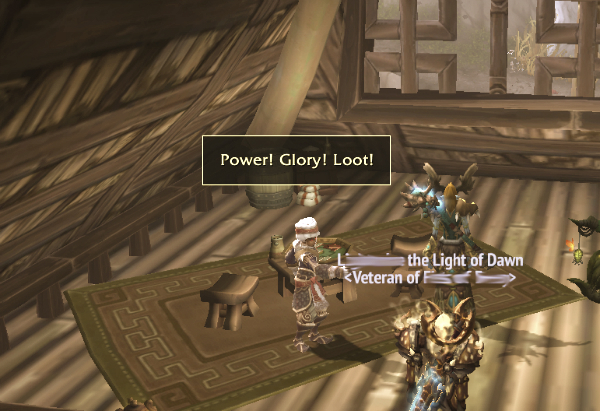 I just found the idea of Wrathion saying “loot” hilariously unexpected.